PDF files: Low resolution, High resolution (300dpi). 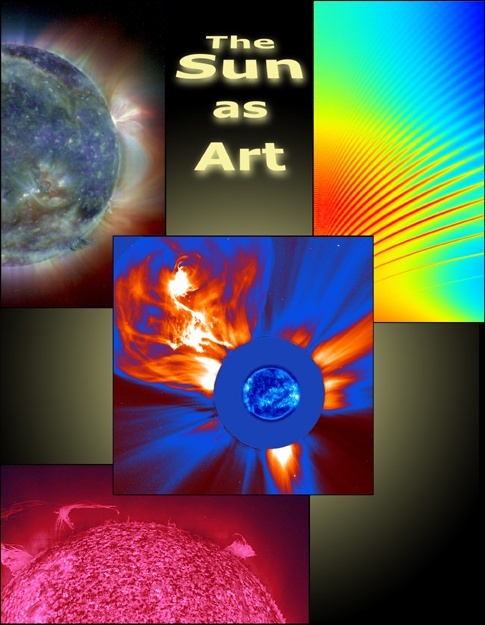 Caption: This 21-page image set, assembled by SOHO Media Specialist Steele Hill, presents a new way of looking at the Sun. Its goal is to highlight the artistic range of colors and shapes and beauty that can be derived from a little manipulation of SOHO images. In some cases an image has only been cropped; in some, only color tables were altered; in the most inventive, pieces have been cut and moved around. At times whimsical and other times instructive, the presentation tries to suggest the variety and wonder of the Sun that SOHO has brought to us. Both files (see links above) are in Adobe Acrobat PDF format. The low resolution version is intended for fast download and screen display. The high resolution (at 300 dpi) is best for viewing a higher level of detail and quality printing. An Acrobat Reader is required to view the PDF file, and can be downloaded from Adobe. If a museum or other institution is interested in displaying this show, please contact Steele Hill at steele.hill@gsfc.nasa.gov.